Director James Wan and screenwriter Leigh Whannell, the creators of the original Saw, dial down the brutality in their latest collaboration, Insidious. The story of a suburban family besieged by demons takes obvious inspiration from Steven Spielberg's Poltergeist, but begins chillingly and eventually crosses over into Ghost Busters territory. The shift in tone from horror to hoax is not altogether successful, but the film still features enough thrills to satisfy the partners' fans while winning over some new ones. The PG-13 rating will also serve to broaden the audience. Expect a modest success at the box office. When weird things start happening in their new home and they spy ethereal beings skulking about, schoolteacher Josh Lambert (Patrick Wilson) and his songwriter wife Renai (Rose Byrne) conclude their house is haunted. At the same time Dalton (Ty Simpkins), their eldest child, has fallen into a coma without medical explanation. Could the two things be related? Josh's mother Lorraine (Barbara Hershey) suggests the couple bring in paranormal investigator Elise Rainer (Lyn Shaye) and her team, Specs (Whannell) and Tucker (Angus Sampson), to unravel the mystery. Elise quickly diagnoses demons and an underworld called "Further" as cause of trouble for the Lamberts' son and home. Wan strikes just the right notes of ever-building suspense as he establishes the trouble that befalls the Lamberts, but when Elise and her team enter the picture, Insidious goes off the rails. Shaye is great, delivering easily the strongest performance of the movie and stealing every scene as the matter-of-fact ghost hunter. Whannell and Sampson are actually very funny as her colleagues, but they seem to belong to a different movie—a funnier one with slime and proton packs. The tonal shift is understandable—lest the film too closely resemble Poltergeist—but it's too jarring. 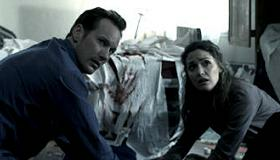 Though the film recovers to build a properly creepy conclusion, the shift robs Insidious of much of its fright factor. One other quibble is the music. Hippie era novelty act Tiny Tim's vibrato warbling of "Tiptoe through the Tulips" is apparently the favorite tune of the head demon plaguing the Lamberts, it's a tune reprised several times. Is this supposed to be scary? Honestly? Why not "Gypsies, Tramps & Thieves," or "In the Navy" or anything from the collected works of Celine Dion? That seems like a minor point, but with a perfectly scary setup, a bang up opening and a great cast, Insidious could have been something special: a horror movie that actually horrifies without resorting to gore. Instead, thanks to too many cheap jokes and a bit of silly music, it falls short. Rating: PG-13 for thematic material, violence, terror and frightening images, and brief strong language.